Hailee Steinfeld, Noah Cyrus, Julia Michaels, and Grace VanderWaaal will all be hitting the stage at the Microsoft Theater in Los Angeles on Saturday, April 29, for the awards ceremony. They’ll be joining Kelsea Ballerini, Alessia Cara, Jordan Fisher, and Train who were already previously announced earlier in March. Picture 01: He’s been hired. Picture 04: 5 MILLION OF YOU?! THANK YOU for your constant love and support. Thank you for sticking by my side and thank you for listening even when I’m quiet. I love you. ??? 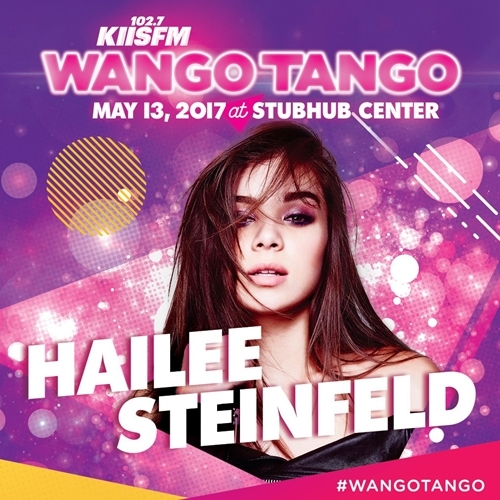 Ryan Seacrest and iHeartMedia’s KIIS FM announced Friday that rapper Machine Gun Kelly, former Fifth Harmony singer Camilla Cabello and Academy Award nominee and singer Hailee Steinfeld will also hit the stage at the StubHub Center in Carson, California, on May 13. Tickets for KIIS members go on sale March 31; tickets for the general public go on sale April 1. As the new brand ambassador for Reef, Hailee Steinfeld is currently starring in the brand’s spring ads, with another campaign set to launch in early summer. FN got an early look at the new campaign, which features Steinfeld in ripped jeans, a pop-art-print jacket and the new tortoise-shell flip-flops launching this fall as part of the Reef Escape collection. Recently, FN chatted with Steinfeld about partnering with Reef and how she puts together those great looks for her red-carpet and onscreen appearances. What made you want to work with Reef? One thing I find super-important when it comes to any collaboration is having a personal connection. Being born and raised in California, I grew up wearing the sandals, and as long as I can remember, multiple pairs have been at the bottom of the staircase, right by the door. It’s evolving, and I feel like it will continue to do that forever. Especially in the past two years or so, I’ve been getting into the music world and finding my identity in the music space versus being on a red carpet. For my own very personal style, I like to keep it comfortable and simple. What’s it like collaborating with your stylists, Rob Zangardi and Mariel Haemm? I’d been a huge fan of them for a very long time. We’ve been working together for a little while now, and they helped me find my confidence in the music space and the red-carpet space, and how I can make it seem like they’re not two completely different things but they do have a separation. I trust them a lot. How do you put together your red-carpet outfits? It’s based on how you feel in it. I love taking risks. I love that fashion has become such a huge part of my world. [With Rob and Mariel], I don’t have to say anything to them because they’re so amazing at what they do. I’ve been on the road a lot lately, so it’s been hard, but we’ve sent each other references. And our conversations are sometimes based around certain designers or shows that are happening and collections that we love. Out of all the characters you’ve played, whose style did you connect with the most? For my movie “The Edge of Seventeen,” I was very involved in the wardrobe. It was very hard to find her because here we have a character who was verbally called out in the movie for having a bad style. So we wanted her look to be quirky and different but still aspirational, where anyone could look at her and say, “I don’t see what’s wrong with what she’s wearing; it’s who she is.” It’s fun to go that extra mile and make a conscious decision to wear shoes that had dogs on them with socks that had cats on them. I wouldn’t necessarily wear an outfit the way she wore it, but I admire her ability to not care what anyone thinks. I relate to that. Around this time of year, most 20 year-olds are gearing up for spring break. Hailee Steinfeld, however, is not a typical 20 year-old. While many of her peers are taking off to Mexico, the multi-hyphenate star is in the midst of filming Pitch Perfect 3, and balancing her pop music career. Should she ever need a beach vacation–or rather, have time for one–the actress is not lacking in the proper footwear department: Steinfeld was just named the face of REEF sandals. Here, the actress and singer shares her top warm weather travel tips, as well has her upcoming summer plans, and the eternal debate of to Coachella or not to Coachella. I happen to love driving. There’s something about hopping in your car that gives off a choose your own adventure vibe. It’s more on your own terms than other forms of transportation and I love an opportunity to be spontaneous. I do also love flying because I can catch up on movies and sleep. I love sitting next to my mom whenever I’m traveling. We laugh ourselves to sleep pretty much every flight. I wish I could say I was currently reading a book but I find that when I do have downtime to read, I’m catching up on scripts or reading the latest breaking news online. There are too many to choose. Paris and Tokyo both have special places in my heart for different reasons but I also know there are so many places I haven’t even yet gotten to visit. I’m so lucky that my job takes me all over the world. It’s surreal. During her recent visit to New York, the 20-year-old American actress opened up about her wardrobe for the upcoming “Pitch Perfect 3.” Speaking to FN, Steinfeld said her character has changed and developed in two years’ time. In a separate interview, Hailee Steinfeld also shared what viewers can expect from “Pitch Perfect 3.” Aside from the wide range of acapella, the highly anticipated sequel will also feature tons of dance moves. “Pitch Perfect 3” will see Anna Kendrick as Beca Mitchell, Mitchell Rebel Wilson as Patricia “Fat Amy, Hailee Steinfeld as Emily Junk, Brittany Snow as Chloe Beale, Elizabeth Banks as Gail John and Michael Higgins as John Smith. The upcoming sequel will also see rapper Trinidad James as an individual from a contending singing group and “The Accountant” actor John Lithgow in a top-secret role. Directed by Trish Sie, “Pitch Perfect 3” is scheduled to be released on Dec. 22.